For some reason or other I thought that this band was not for me. I can't remember why, the impression that this was a dance duo?, but there was something about the reviews to date that made sure that I never listened to one of Death from Above 1979. Boy was I wrong! Another duo band, another unusual line up, bass-drum with embellishments here and there, but so melodic, so up beat and so alive. From the very first note the pedal is down the metal. A question that sort of presents itself to me is why does anyone who can play like this want to play a bass guitar and not a regular electric one? The sound of this bass is definitely different. A whole truckload of effect boxes is let loose on the innocent bass guitar, which creates a large sound, omnipresent. The drumming fills up all else. Apart from that the duo does not shun things extras that make the songs a bit different and more melodic. Not unlike The Black Keys, with which I'd start comparing Death from Above 1979. Death from Above 1979 is a Canadian band from Toronto. Jesse F. Keeler on bass, synths and background vocals and Sebastien Grainger on drums and vocals. In 2004 the band released an album,'You're a woman, I'm a machine', but disbanded in 2006. Both musicians worked with others in the meantime. In 2011 they started playing again, which led to The physical world, ten years after the release of the band's first album. The most noticeable feat on The physical world is the variety and melodic strength of the album. Working in a duo format has to bring out the best in both partners. In the olden days that was conceived by harmony singing, think Simon & Garfunkel. In more modern days by cooking up storms on an instrument and drums. For me personally all that started with The White Stripes over ten years ago, after which many other duo bands followed. 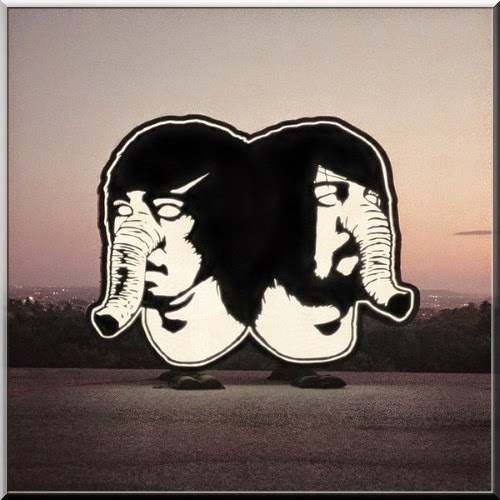 In 2014 Death from Above 1979, having missed that which went before. Royal Blood, another bass-drums band, was reviewed earlier on this blog. Both bands compare favourably to each other I have to say, being able to bring more out of a song than at first sight seems possible with drums and bass. The physical world has a fullness and richness in sound which I think to be warm and includes the, extremely effective and totally convincing, essence of what a whole band could have done with these songs. Truth be told that is because of some pleasant overdubs. Like The Black Keys and The White Stripes burst out of the duo setting in the studio. What all that does, is make this album not only a rocking record, but also a rare form of pop record. A song like 'White is red' must be a hit in another universe for sure. At the same time Death from Above 1979 can start a desert rocker, mix in some Bee Gees vocals and rock on some more. The duo does not let itself be tied into a small rock corner. It explores all the other corners, crawls through the space beneath the floor, dirt and all and drags it along to take a long, pleasant peep outside, through the veranda's French doors, with and without the Venetian blinds closed. The result is multi moods and approaches to a song. The basis may be alternative rock, but a lot of goodies were stacked on top, and that is what creates the luring mix The physical world is. Raise your fist, but don't forget to put a smile on your face and sing along. It is all possible on The physical world.